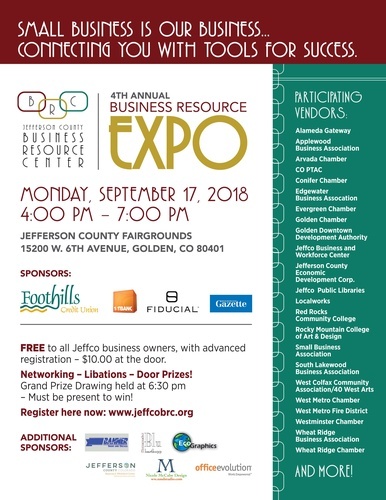 Join us for the 4th Annual Jefferson County Business Resource Expo held at the Jefferson County Fairgrounds, 15200 West 6th Avenue, Suite A, Golden, CO 80401. All Jeffco Business owners are invited! This year’s event will host over 35 vendors – all dedicated to your success. The Expo is a great event to learn about the available resources in Jeffco while providing an excellent opportunity to network with business owners from all areas of Jeffco. Networking - Libations – And lots of great door prizes! Door prize drawing at 6:30 pm! The Expo is FREE for all Jeffco Business Owners with advanced registration or $10 at the door.